If you run a small business, chances are that you find handling the financial side of things about as fun as getting your checks tied to a rock thrown straight through your office window. Fear not, however, for Rockaway, New Jersey-based Acclivity Software has announced the release of AccountEdge Basic, an accounting package for OS X designed, as its name suggests, with basic needs in mind. 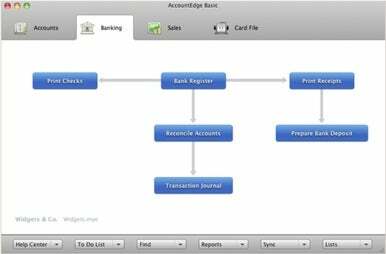 AccountEdge Basic features a flow-based user interface to simplify the management of financial transactions. Created as a simpler cousin to the company’s flagship AccountEdge software, AccountEdge Basic is aimed at small businesses and supports all the essentials connected with running the financial operations of a company: managing sales, banking, and payments, as well as generating a variety of reports. AccountEdge Basic shares a common user interface with Acclivity’s other accounting package, including an innovative workflow view that helps the user follow a financial transaction through its entire lifetime, from quote to receipt—perfect for business owners who are not familiar with the intricacies of bookkeeping. For customers who encounter difficulties, the company makes free support available via email, with phone support plans available for an additional fee. According to an Acclivity press release, the app integrates with several add-ons that work with the full version of AccountEdge, such as a payroll module and a service that allows businesses to charge credit cards. AccountEdge Basic also works with the company’s mobile app, once Apple approves an update that enables the two software products to exchange data. AccountEdge basic requires OS X 10.5 or higher and can be purchased for $99 from Acclivity’s website. A free thirty-day trial, is also available.